If you came here from the Swirlydoos blog, then you are on the right track! If not, go back, and start from there. We have some amazing projects for you to see today !! Make sure to leave a comment on all of the blogs for a chance to win!!! Check out Swirlydoos on Facebook and Like Us!!! It's the PERFECT time to subscribe, so if you've been draggin' your feet, jump in so you can have a chance to win this amazing prize! DO IT NOW!!!!! I was in pink heaven with this kit! Pink is NOT my color, but I really had a great time playing with this kit! The colors are so perfect for summer pics. My first project is a wall hanging I made with the August tech/project kit, featuring Martha Stewart silkscreens and Clear Scraps Acrylic. The picture is of my pal and fellow education teamie, Andie. We did a photo shoot a couple of months ago at Swirly Camp 4, and this is a shot that I just LOVE! I flipped some aspects of the sketch to work with this fabulous Bo Bunny paper,. 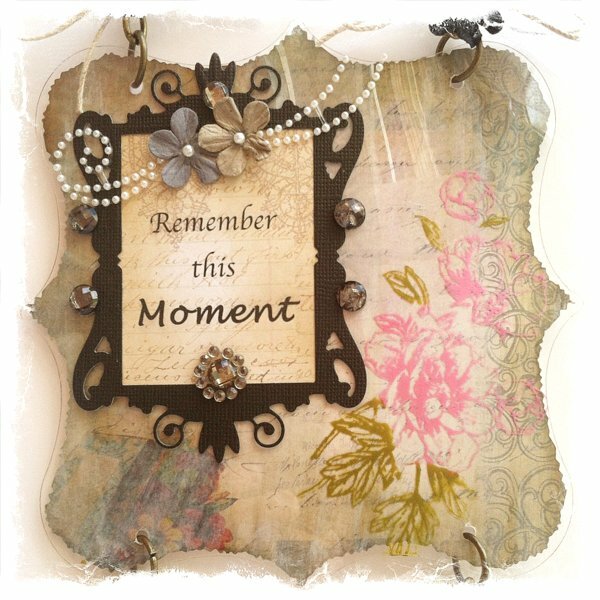 The top layer has some wet distressing and lots of Chestnut Roan chalk ink to accent the vintage feel of the papers and picture. 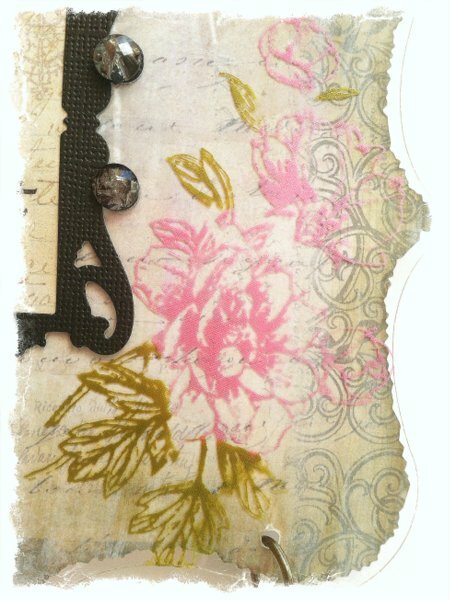 I added some mini roses and a Zva flourish from my stash. This was my first page I did with the kit. I loved the cream/pink/green combo so much, and wanted to throw some black in the mix. The pic is of me from the Swirly Camp photo shoot. The "greenery" is a Crafty Ann die. I created some faux stitching around the layers. 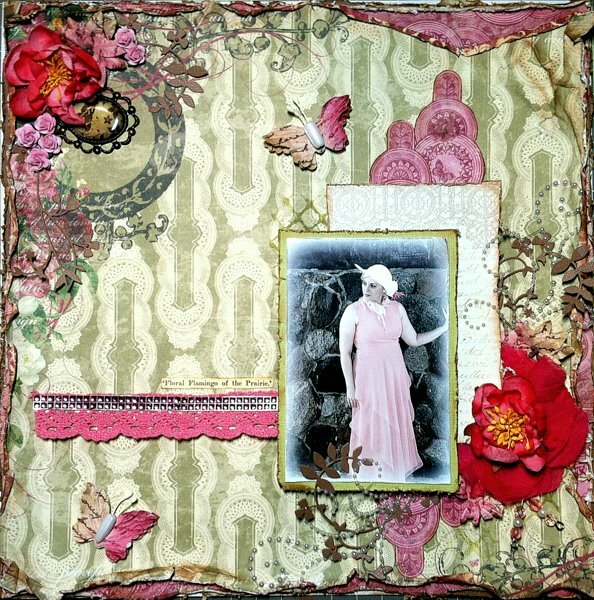 I used a Heidi Swapp mask at the top: first with the Silks paint from the kit. Then, I moved the mask slightly and used black embossing paste for a layered mask look. Holy fussy cutting! That's most of the technique for this layout. The sign at the top is fussy cut, along with the right side and bottom of the page. 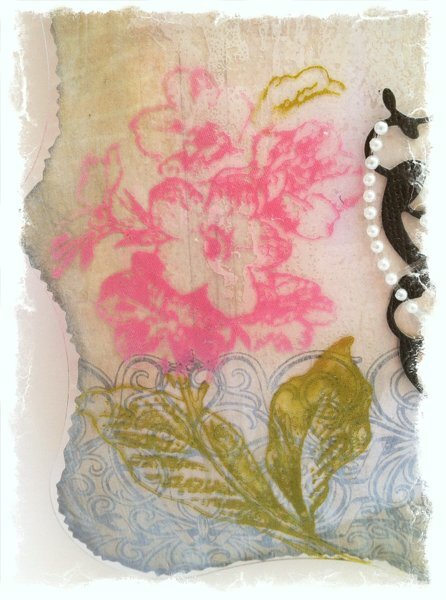 I used the pink Art Anthology Velvet paint on a mask on the inside the circle on the top layer of paper. The pic is one of my faves of my daughter looking sweet. She can be very difficult for me, but I am so proud of her for not being afraid to be different. She could care less what everyone else is doing, saying, wearing, etc. She has her our style and ideas, and she's very comfortable being that way. It takes courage to be this way and only being 8! 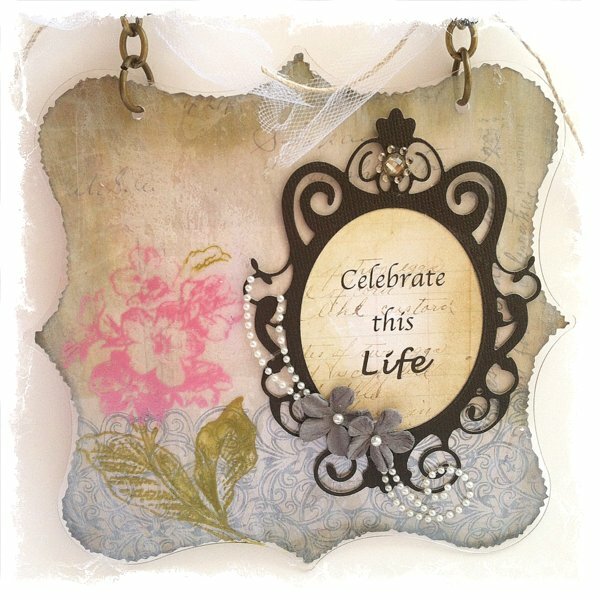 The party continues at amazing guest designer, Tara Orr's blog. (OMW, she did some awesome things with this kit!!) Have fun! gorgeous kit and creations! 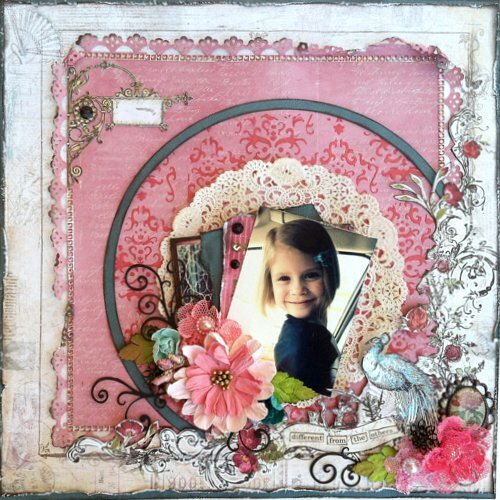 Love your style of scrapping! The projects are amazing. I think the one of Andie is my favorite. 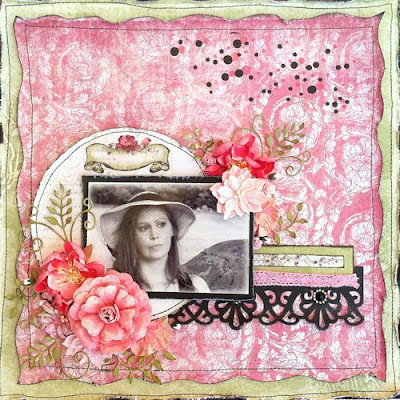 Beautiful august collection and your wall hanging is simply superb and co lorful layouts. thanks for sharing the video. Great layouts. LOVE the project and can't wait to get my kit so I can play with it!! Great layouts. I'm going to try the silk screens. Always looking for new techniques. Rae, Your wall hanging is gorgeous. I can't wait to pick mine up today. Beautiful fussy cutting! Sigh.... I so LOVE all your AMAZING projects with the kits. Awesome work honey. Oh MY! I so look forward to seeing what you do every month! SO beautiful!! Beautiful wall hanging!!! Beautiful layouts too! Can't wait to watch your video! Oh my, your work with this kit is totally gorgeous! I just love your style! Beautiful work, so excited to see a complete project video. Gorgeous august Collection and beautiful layouts. Absolutely drop dead gorgeous work this month. You are an amazing artist. You wall hanging is sooo pretty!!!! I also love you pages. Awesome fussy cutting! This is my first month as a subscriber..so excited to see all the things I can do with this kit! Thank you! Beautiful work! So. I'm still trying to pick my favorite among all of these gorgeous projects. Love the colors, love the photos, love the designs and I cannot wait to get started on my wall hanging. Pink, Pink, I love PINK!!! I did not get the tech kit, but was thinking of buying it at the store, but wanted to watch your video first to see how to use the products. Great video. I know what I will be doing next. Time to shop!! really enjoy your layouts. What lovely wall hangings as well. Really enjoyed seeing what you did with this kit! Love the colors. You are so creative. Your fussy cutting was so well worth it. The scroll sign on the page of your daughter especially. Wonderful job this month...as always. 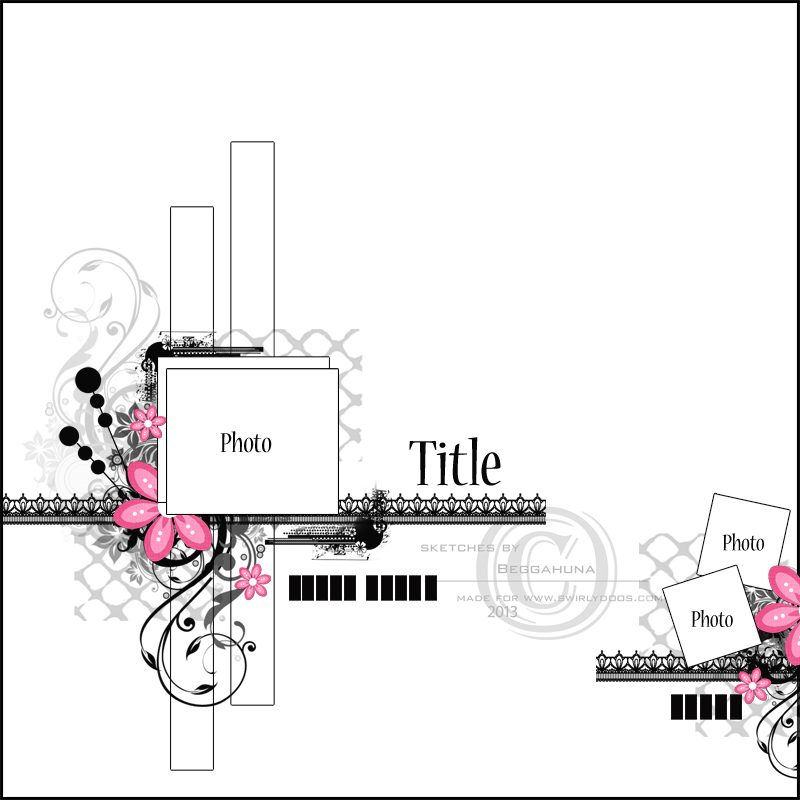 Beautiful wall hanging and layouts! I look forward to your tutorial videos...thanks for sharing your expertise! Very beautiful layouts. Love the pink. Your daughter is so cute. Oh wow so many Beautiful projects...I think the wall hanging is my fav! just beautiful! thank you for the inspiration! 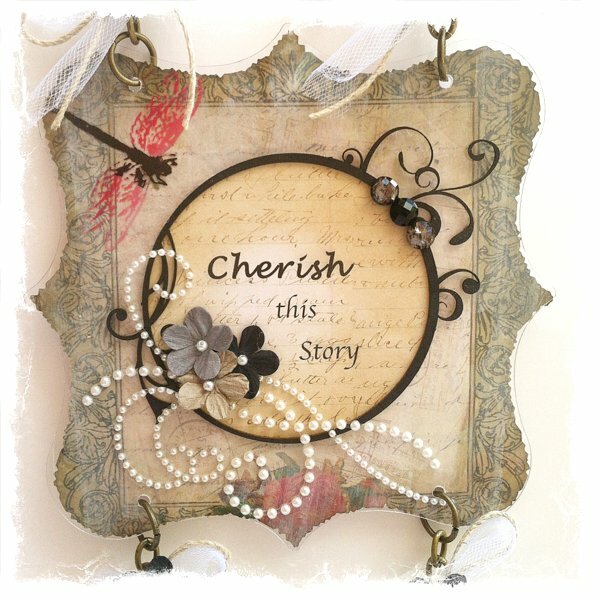 Gorgeous wall hanging! I've never tried silk screening before will be back to watch the videa! TFS! The kit is stunning this month and your projects are absolutely gorgeous. Just became a follower. Great blog Rae and I love the new silkscreen project. Can't wait to get the new kit. Take care, Debbie L.
Love that photo of Andie, and that one of you is my fav. Love the kit. Can't wait to dig into it. You are so talented. Lovely projects. Love the the wall hanging. Very clever. Thanks for the video too! Oh my! What gorgeous projects, Rae! Absolutely love the wall hanging!